On this book's blurb it says the author offers a 'new home treatment... that may bring easy, safe and lasting relief from pain' and that can help many ailments. 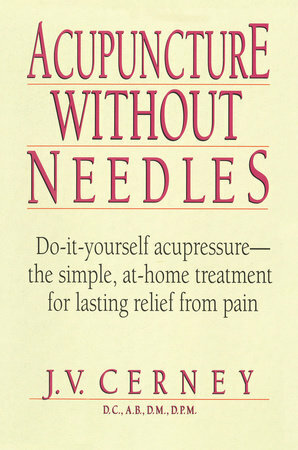 So if you are looking for a non-pharmaceutical method for relieving and reducing pain, this book by Cerney may be worth reading. The book should be of special use to anyone who suffers pain from the small spinal fractures that are often painful and can lead to kyphosis (back hump). The book does not address bone loss directly BUT it does show you how to find acupuncture points and how to stimulate them with your finger (using correct movements). Some readers of this site about reversing Osteopenia and Osteoporosis may be interested in this non-pharmaceutical treatment method. More: Acupressure Acupuncture Osteoporosis, Osteopenia. The author demonstrates finger pressure on various acupuncture points to heal yourself and to relieve pain. His book is especially helpful for those of us who are novices since includes he many diagrams of the body with the acupuncture points marked and labeled. C. Norman Shealy, MD. says that certain acupuncture points, which he calls The Ring of Fire, increase Calcitonin, a chemical that slows the removal of old bone and enhances (or produces) re-calcification of osteopenic bone. (It should be noted that Calcitonin may also reduce bone pain). If you have read Acupuncture and the Ring of Earth you know which points associated with this way of reversing bone loss. J. V. Ceney can show you the CORRECT way to stimulate those points. Special Note: This book may also be of interest to anyone with arthritis who wants to avoid pain medications (which often are a cause of bone loss). The book should also be of interest to anyone with kyphosis (dowagers hump) since this condition is often a cause of chronic pain. Acupressure without Needles is not a new book. You are not likely to find it in your local book store (although if you have a nearby shop for used books, you might find a copy.) But the book IS available at Amazon in both paperback and hardback. Have you read Acupressure Acupuncture Without Needles with an eye to using Acupressure Acupuncture Osteoporosis, Osteopenia? Is so would you share your thoughts about this book with other readers of this web site? Did you find the book helpful? Is it worth reading? If you have read this book, do share your comments! SPECIAL NOTE; Anonymous submissions and submissions with urls will not be published. Thank you for understanding. Your comments will appear on a Web page exactly the way you enter it here. You can wrap a word in square brackets to make it appear bold.